Tragic events at his job have turned former cop work Ben into an alcoholic, who drives himself more and more away from his family. He decides to take a job as a night guard of a closed department store that was partially destroyed in a fire. As he starts to work there, he notices strange things whenever he looks at the mirrors. 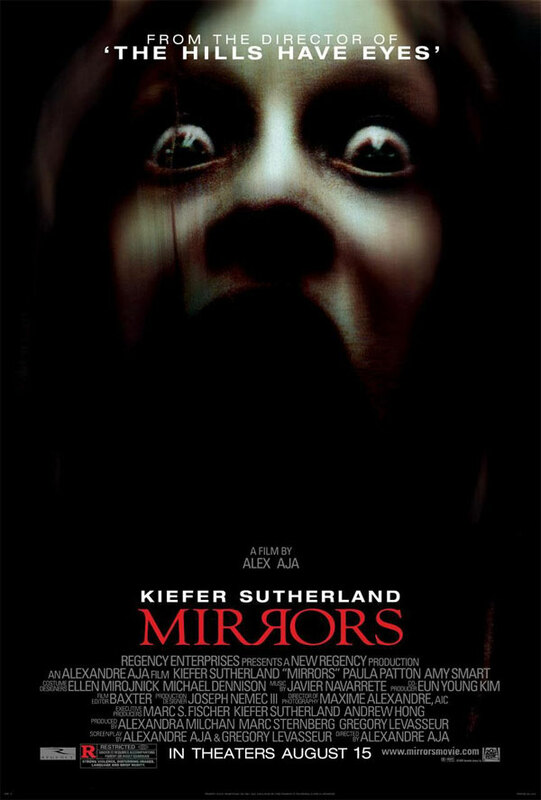 When I heard that Mirrors was directed by Alexandre Aja – director of Haute Tension and the 2006 remake of The Hills Have Eyes – I figured it is going to be worth a watch. As usual for Aja the gore scenes are extremely intense, and definitely make you turn the other way. Mirrors is the remake of a Korean movie called Into The Mirror, but it is different in many ways: While Into The Mirror tries to create a suspenseful mood simply by atmosphere and sound effects, Mirrors scores with his additional gore scenes as mentioned above. The stories are somewhat similar but not identical. When I saw it for the first time I was literally tripped out by a few very disturbing scenes, and thought I would never watch it again. However, after a few years I wanted to give it another try, and knowing what’s going to happen I expected not to be as creeped out as I was in 2008; I was wrong. It was still very intense. If you have a weak stomach you might reconsider watching it. Mirrors is a suspenseful movie with convincing actors; it will have you gasp a few times, it will shock you, and take you on a very creepy ride. The last fourth of the movie gets a little boring, but it picks up again towards the end. A great movie for Halloween.